From morning sickness to unusual cravings, there are a number of different symptoms that come along with pregnancy. Although it can be fun to eat ice cream and pickles or show off your growing bump, there are a few other symptoms that aren’t as enjoyable. In addition to stretch marks, approximately half of all pregnant women experience various degrees of acne at some point, which can last for several months or for the duration of the pregnancy. Although it may be unpleasant, there are a few ways to deal with blemishes and keep them at bay for a calming and flawless pregnancy skin care routine. Blemishes often cause an uneven skin tone, which can make it difficult to have a glowing complexion that truly radiates. Honey is a safe and natural product that works to remove dirt from the pores and even the skin tone with the antibacterial properties that it contains. By applying a honey mask for 15 minutes every few days, it will fight inflammation and help to hydrate the skin for a beautiful, even complexion. Although you don’t need to bake while in the sun, opt for a dose of UV rays every few days for a great way to reduce acne and prevent blemishes from developing. This will work to kill acne bacteria that is present for a smooth complexion that receives plenty of vitamin D. As you lay out, it’s also important to avoid overheating from the high temperatures, which can cause rashes to develop on various areas of the skin. Spend a limited time outdoors and also stay out of hot kitchens until you deliver to protect your health. It can be easy to become dehydrated while carrying a growing baby, which can wreck havoc on your skin and allow it to become irritated and flaky. Drink at least eight cups of water each day to flush out all toxins that may be lingering and causing you to break out. You can also snack on foods that have a high water content including watermelon, celery, cucumbers, pineapple and tomatoes. Pregnancy acne can often be attributed to a boost in hormones, which can cause extra oil to be produced by the glands. Skin care experts recommend exfoliating twice a week with a gentle scrub that will remove dead skin cells. This will cleanse the pores and create a smoother texture to allow acne to heal and also prevent it. For daily cleansing, opt for using an oil-free acne wash that contains natural ingredients and hydrates the pores. Due to your high levels of estrogen, it’s important to also use a product that contains tea tree oil or rosemary extract to kill bacteria that is present. Avoid face washes that contain salicylic acid, which is unsafe for pregnant women. Although you may be hesitant to apply moisturizer on your face out of fear of breaking out due to your pregnancy skin issues, it’s important to moisturize to prevent acne that can occur with dry skin. 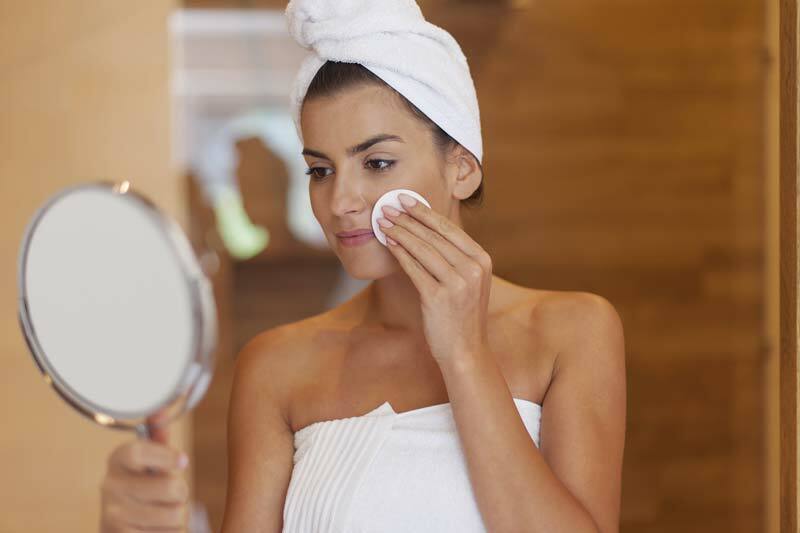 When cleansers and facial products cause dry skin, it can cause the oil glands to overproduce, which quickly leads to clogged pores and blemishes. Moisturizing in the morning and at night will allow the oil glands to relax and remain stable. It’s also important to use cosmetics for dry skin to prevent the environment from having direct contact with the pores, while also locking in moisture that is already present.